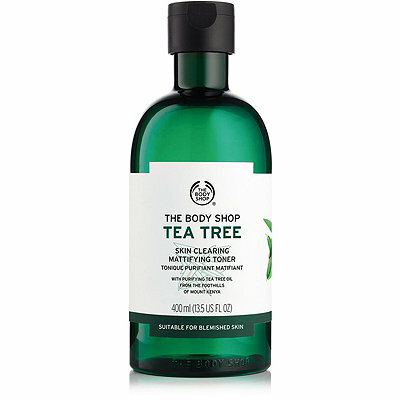 The Body Shop Tea Tree Skin Clearing Mattifying Toner infused with potent tea tree oil, purifies and tones in one step. The Body Shop Tea Tree Skin Clearing Mattifying Toner infused with potent tea tree oil, purifies and tones in one step. Use after cleansing to remove any residual traces of makeup and impurities, which can clog the pores. With shake-to-activate mattifying powders, this toner minimizes the appearance of pores and leaves skin feeling clean, toned, refreshed and visibly clearer.